The 2018 Volkswagen Atlas may just be the perfect midsize SUV for you and your family. Yes, we understand that’s quite a statement, but when you discover everything that the new Atlas has to offer, you may find that it’s not that far off. Indeed, the 2018 Volkswagen Atlas provides its owners with an almost unrivaled blend of interior space, comfort, performance, and technology; but it is also one of the most refined models in its segment with luxury features you would expect to find in models costing a lot more. Let’s start with interior space. Inside the Volkswagen Atlas, buyers will find three rows of seats with plenty of head, leg, and elbow room at every seat. The middle seats are particularly spacious, and particularly accommodating for both children and teenagers. With all seats in place, there are nearly 600 liters of cargo space which means that unlike many of the Atlas’ competitors, you can have more than 5 passengers on board with still plenty of space for everyone’s luggage. Lower the rear seat, and you get roughly 1,500 liters of total space. And behind the wheel, you will find that the Atlas features one of the most impressive drives you can find in this segment. Yes, Volkswagen’s midsize SUV is comfortable and quiet, but its handling is also very impressive, and you can actually enjoy driving it both in the city and on the highway. The entry-level engine option is a four-cylinder unit that delivers 235 horsepower. This engine stands out in the fuel economy department, but it is also quite impressive in terms of capability with a towing capacity that can reach 909 kilos. The next engine option is a 3.6-liter V6 engine that delivers 276 horsepower and 266 pound-feet of torque. This engine is obviously more powerful, and it can also tow more than 2,200 kilos. 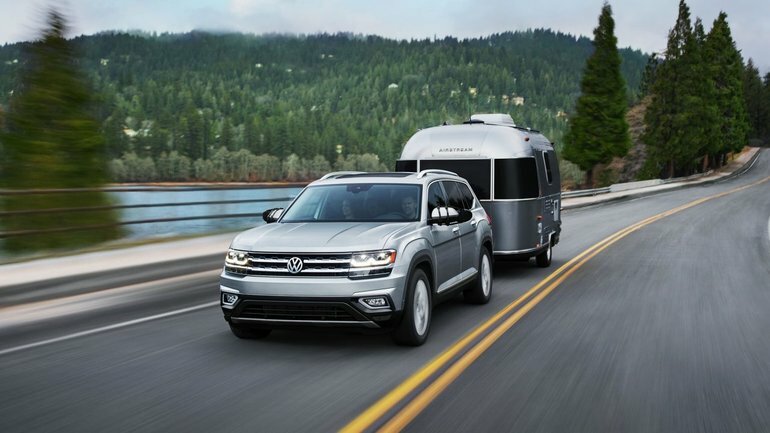 To learn more about the 2018 Volkswagen Atlas, contact us today at Vernon Volkswagen!